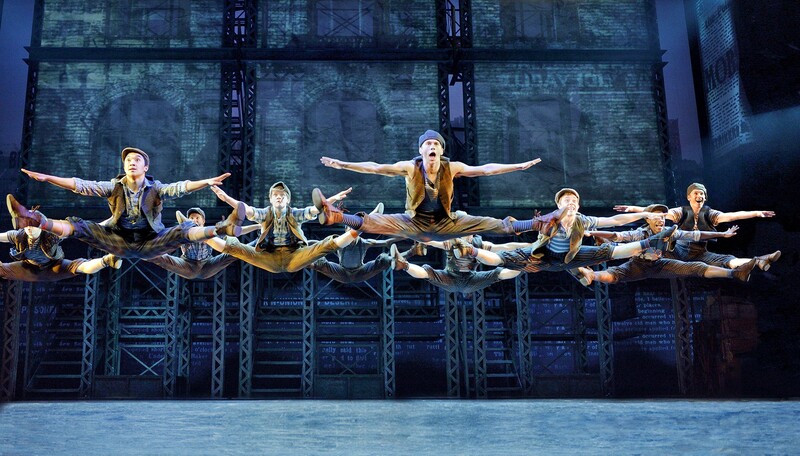 Newsies' all-male dance troupe wowed audiences with their acrobatic jumps, flips, kicks and spins. Audiences at Tuesday's opening night of Newsies' five-day Spokane stop poured out of the INB Performing Arts Center feeling energized and uplifted after the two-and-a-half hour production wrapped. Our heads were filled with snippets of song from the hit musical's catchiest numbers: "Carrying the Banner," "Seize the Day," and "King of New York." Our minds were blown by the epic choreography and athletic skills of the mostly male cast in a show based on true events surrounding the 1899 newsboys strike in New York City. Knowing the plot of the Tony Award-winning (for Best Choreography and Best Score) show was largely plucked from a live-action Disney film by the same name (released in 1992 to become a major box office flop), my pre-show expectation was that it would largely consist of the cloying sentimentality that Disney so readily delivers. However, by night's end I found myself pleasantly surprised. Actors playing several major characters in Newsies hit their roles on the mark. Without doubt, the star of the show is Joey Barreiro, who plays Jack Kelly, the charismatic leader of the Manhattan newsies. Other standouts include Stephen Michael Langton's portrayal of newcomer newsboy Davey, and whom we interviewed for our show preview. While some of his line delivery was a bit over-emphasized and rushed, the youngest member of the show, 9-year-old Turner Birthisel — he shares the part of Davey's little brother, Les, with Ethan Steiner, each taking turns acting in every other show — was another memorable actor who charmed the audience with his silly one-liners and tough-kid attitude. In a show that tells the story of a group of rough-and-tumble newspaper boys who were orphaned or from struggling, working-class families, roles for women in Newsies are few. In a change from the original Disney movie that replaces a young male journalist with the female character of Katherine Plummer, the only notable role by a woman is played by Morgan Keene. A former resident of Spokane, Keene and her family moved away a few years ago so she could pursue a professional acting career. Before leaving, she last acted locally as Sandy in the Spokane Civic Theatre's 2013-14 season production of Grease, among other roles. As Newsies' Katherine, her first few scenes featured a delivery in a tone that was too condescending and presumptuous for me to bear, as intentional as these traits may have been to those earlier moments. Thankfully, as the plot advanced and Katherine became more sympathetic to the newsies' plight, Keene toned down the sass and evolved into a version of her character that was much more palatable. Of all highlights in this touring production of the Broadway hit, Newsies definitely proves that 2012 Tony Award for choreography was well deserved. The current touring cast has no trouble delivering the acrobatic stunts present in every number, from tapping raucously through "King of New York" and pirouetting atop actual pieces of newsprint laid on the stage floor in another number. Contributing in a major way to the success of each musical moment is Newsies' innovative set design, which employs the use of several three-story, mobile scaffolds that often frame specific moments on stage and allow never-ending vertical movement for a story set in the high rises of early New York. The cast's energy never waned during Tuesday's two-and-a-half hour performance. It was apparent they all love being on stage — dancing and singing their hearts out for night after night — as much as we loved watching them. Newsies plays through Sunday, May 8, with evening and matinee show times still available. Find tickets here.